Beard studied locally at Reed College, but in 1922, was expelled from the school for homosexual liaisons with other students and with a professor. (Ironically, in 1974, he received an honorary degree from Reed, after he had become a celebrity.) After the scandal, Beard took voice lessons in London from Enrico Caruso’s coach and later returned to Portland, where he pursued a career as an actor. 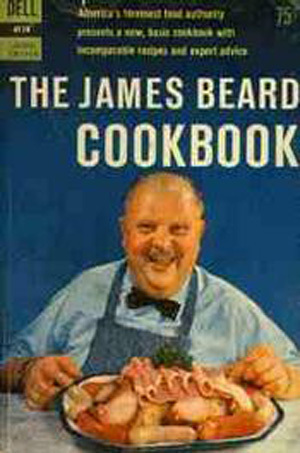 Eventually, Beard relocated to New York City, where he achieved fame as the author of numerous best-selling cookbooks. The well-known culinary institute, the James Beard Foundation, was named in his honor and is located at the site of the Greenwich Village home he shared with his lover, architect Gino Cofacci. If it wasn’t for Julia Child and James Beard, most of us would still be eating dry roast, mushy cauliflower with melted Velveeta. Thanks for writing such a great post about a culinary master. Now, I’m hungry! I love your site…I’ll be back to visit often.